The interior of your car takes a lot of abuse. Unlike the inside of your home, which has many times more square footage, the inside of your car gets repeated, concentrated traffic. Each time you get in your car, you drag in more dirt. Each time you eat or drink in your car, you add a few more crumbs and spills. In fact, just sitting in your car, you drop hair, dead skin, makeup and other contaminants. All of this dirt and junk adds up very fast. It is not necessary to fully detail the inside of your car each time you wash it. Unless you've been to the beach, out in the mud, or tracking in grass and leaves, you can probably get away with vacuuming and a quick wipe-down every couple of weeks. Wipe down all vinyl, leather and plastic surfaces with a damp cloth. A Blue SilverClean Interior Detailing Towel is excellent for this task, as it will leave a lint-free, dust-free finish. Wipe down your door jambs and doorsills with a damp microfiber towel. Wipe down your interior glass and your rearview mirror with a glass microfiber detailing towel. If your windows are relatively clean, you don't need to use a glass cleaner. 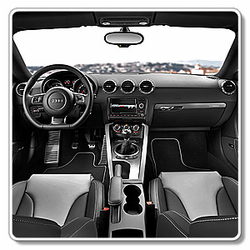 Very recently, a new product category has emerged for the car interior that's equivalent to the exterior quick detailing spray. Interior cockpit sprays, like Sonus Cockpit Detailer, combine light cleaning and protective capabilities in a spray-and-wipe system. If you're looking for an interior product that keeps your cockpit looking perfect, you might give it a try. In my mind, this is a much better solution than layer after layer of protectant. 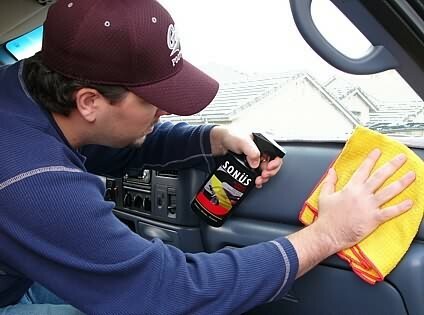 A weekly wipe down with the Sonus Cockpit Detailer keeps your vehicle fresh and prevents the need for heavy cleaning later. Follow all of the steps for the Weekly Interior Cleanup. Clean the interior glass with a good glass cleaner and a microfiber glass towel. Apply a vinyl protectant with an ultraviolet (UV) light inhibitor to the dash, console and tops of door panels (the areas with the most sun exposure). I find that a foam applicator works the best. Follow all of the steps for the Monthly Interior Detailing. Follow all Monthly Interior Detailing Steps.